According to some Taoist traditions the Seat of Life (or Ming Ma) is a vital energy-vortex traditionally located in a small region of the back that sits directly opposite the navel. There are numerous esoteric practices for bringing chi into the Ming Ma for the purpose of strengthening life force since healing energy that is brought into the Ming Ma tends to circulate throughout the body strengthening the internal organs and increasing the flow of chi in the meridians. Chi, for those unfamiliar with the term is a subtle form of energy described by numerous Taoist traditions. It permeates the cosmos according to Taoist philosophers and alchemists. Chi tends to concentrate in natural settings such as lakes, oceans, forests and mountainous areas, which is why Taoist practitioners generally prefer to be in nature. There are many classifications of chi depending upon its origins and quality. Chi that originates from the Earth is sometimes referred to as terrestrial chi, while chi originating from cosmic bodies and from space itself is often called celestial chi. In Taoist alchemy it is held that the more subtle the chi the more potent it is. The most subtle forms of chi originate neither on Earth or in the cosmos, but rather this form of chi is said to originate from Formless Heaven—a Taoist term meaning a vibratory realm of existence that has no form, is primordial in nature and is the Mother of all Chi. Thus Formless Heaven is the primordial source of all chi. Chi that originates from this realm of being is said to be the most potent in its healing and transformational effects. In the human body, chi is related to life force and when chi flows properly through subtle energy pathways known as meridians, health and wellbeing are increased. Chi is also related to the concept of prana as described in the spiritual and medical traditions of ancient India. The sounds you will hear in this particular meditation were channeled from Formless Heaven and thus have very subtle and potent healing properties. Chi has a natural tendency to follow awareness, and wherever you focus your attention the chi generated from the sounds will tend to move into that area. The area of focus for this meditation is the Ming Ma, which you may recall is located directly opposite the navel in the spine. All you need to do during the sound meditation is to focus your attention in your Ming Ma. Simply place your attention (or mental focus) on the Ming Ma and imagine that the sounds you are hearing are coming from the Ming Ma itself. When listening, it is important to focus your attention in your Ming Ma. This is a relaxed awareness, not concentration. If you concentrate too hard, you will constrict the flow of chi into the Ming Ma. Think of resting your awareness in your Ming Ma much like a feather might rest in the palm of your hand. When your mind wanders, simply bring it back to your Ming Ma. The vocal sounds will stimulate a flow of chi within your Ming Ma whenever your attention is focused in this area. Depending upon your sensitivity and awareness of subtle energies, the chi that is released into your Ming Ma may take different forms. Some might actually feel the movement of chi from the Ming Ma into the meridian system and/or into the internal organs. Some may experience the release of chi into the Ming Ma and into the organs of the body as different colored lights and/or geometries of light. For those unfamiliar with these types of subtle energies, there may simply be a sense of warmth or wellness. If you are new to this type of energy work, it may take several sessions for you to recognize how chi manifests for you. It is not important to see anything in your mind’s eye when doing this meditation, as it is not a visualization technique. Generally speaking, having a felt-sense of the flow of chi (as in physically sensing it) is superior to just seeing it in your mind’s eye. If you see the flow of chi, enjoy the visuals, but also strive to feel it, as well, since your feeling nature will open the gates (entrances to the meridian system) more profoundly than just visualization. More advanced meditators may wish to experiment with this sound meditation using a particular mental image. While listening to the sound patterns, imagine that you are comfortably warm and seated inside a cave that is tucked inside a snow-covered mountain (Snow Mountain). The cave is open at its entrance and looks out over snow-covered mountains in the distance and a snow-covered valley below. Imagine that it is snowing outside the cave, and that this snow is a highly refined type of transformative chi. Imagine and sense that the air is filled with the potent essence of this refining and healing subtle energy. Hold the idea, or intention, that the subtle essence of this snow-chi is absorbed by your imaginary body that is sitting inside the cave, and from this imaginary body the healing properties of this subtle energy circulate into and through your physical body. Imagine the snow-chi as if it is completely real, engaging all your senses. See it, feel it, hear the sounds, smell the aromas of clear fresh snow and taste the sweetness of this healing chi. In this particular type of imaginal energy work, the cave is the Ming Ma itself. Thus a small version of yourself sits inside this cave, which rests in your spine directly opposite your navel. Imagine that the sounds of the meditation soundtrack are manifesting inside the cave itself, even as you sense the falling snow and its gift of restorative chi. And remember… part of your awareness always remains on the Ming Ma. For a deeper experience, you can listen to this sound meditation multiple times, for as long as you wish. Medical Disclaimer: This sound meditation is for the purpose of exploring Taoist based self-healing states of body and mind. It is not a medical treatment and should not be used as such. If you are experiencing the symptoms of an illness contact a qualified health care professional. Taoist Stillness Practices is an article by Tom, which addresses both Taoist philosophy and alchemy. It also describes, in detail, how to meditate using a Taoist Stillness Practice that is easy to do, highly effective at calming the mind, and reduces the negative impacts of stress. 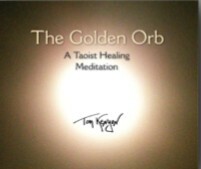 This CD is a live recording of Tom conducting a Taoist Healing meditation (at a Sound Healing Training in 2009). This unique meditation utilizes a potent form restorative chi known as the Golden Orb. The CD contains a talk by Tom about Taoist alchemy and healing, as well as a guided sound meditation. This sound meditation assists the listener to bring healing energies into the body’s major organs and systems. It is a potent healing experience for those wishing to explore Taoist self-healing states of body and mind. This is a live recording of Tom conducting a Taoist Healing Meditation (at a Sound Healing Training in 2009). This unique meditation utilizes a potent form of restorative chi known as the Golden Orb. The recording includes a talk by Tom about Taoist alchemy and healing, as well as a guided sound meditation. This sound meditation assists the listener to bring healing energies into the major organs and systems of the body. It is a potent healing experience for those wishing to explore Taoist self-healing states of body and mind.